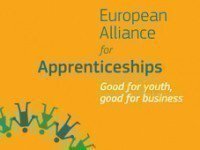 The 4th EAfA stakeholder meeting took place on 5 October in Brussels with two thematic sessions: support for SMEs engaging in and regional approaches to apprenticeships. For the first time Member States and EFTA/candidate countries were asked to join and three countries presented their VET system and reforms. The meeting was also an opportunity to discuss the way forward for the Alliance after the re-boosting event on 22 June in Riga. not being able to provide figures on the supply, but focusing on quality provision). drop-outs from higher education in key subjects like engineering to integrate them in apprenticeships. • Other subjects which were proposed to tackle included entrepreneurship (including cooperation with JA Europe/European Education Entrepreneurship Network), digital skills, the key role of intermediary organisations (SMEs, local and regional approaches etc) and widening access including for women and vulnerable people. including effective social partner involvement for strong VET systems and enhance cooperation with the European Parliament for stronger political backing and better targeted funding opportunities. meetings could benefit from splitting the participants into workshops to encourage more interactive debates and peer learning. Further reflections were needed on how to optimise the meetings in terms of content, output, networking and better respond to the needs of stakeholders.